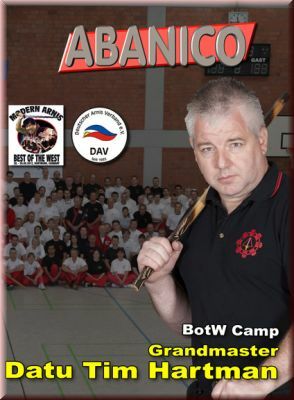 The Best of the West Camp that took place in September 2012 in Dortmund/Germany was with more than 200 participants one of the biggest Modern Arnis Camps ever held. Mott Brian Zawilinski, GM Dan Anderson, GM Datu Dieter Knüttel, MoTT Chuck Gauss und GM Datu Tim Hartman taught at this phantastic event, that was organized by the DAV and Dieter Knüttel. Here you see the teaching of Grandmaster Datu Tim Hartman. 5. Knife to knife drill. The light and especially the sound situation was very dfficult. Sometimes 2 (loud) groups trained at the same time in the same hall. Sometimes the voice of the instructor will sound thin or metal like. This is due to a lot of frequencies that had to be clipped in order to still understand the instructor. Grandmaster Datu Tim Hartman: has had a long and exciting martial arts career. His journey started as a teenager when he started training at a Modern Arnis school and fell in love with the art from the very first class. It wasn’t long before he caught the eye of Professor Presas. After Tim earned his brown belt Grand Master Presas took him as his personal student and protégé. Not long after this Grand Master Presas had Hartman assist him at seminars and camps throughout the United States and Germany. In time Professor Presas took to calling Tim ‘anak’, the word for ‘son’ in the Tagalog dialect of the Philippines. Datu Hartman currently conducts seminars throughout the United States and Canada, as well as England, Germany, Sweden and Denmark.